Creative & Distinctive Lighting Since 1912. 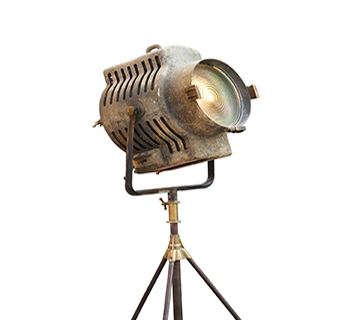 Palette Studios has specialized in decorative and custom lighting for the past 100 years. We make lamps to order and we offer full service repair, whether it is your vintage find or a treasured family antique. We have a large selection of stock lampshades and offer custom shade recovers and relines. Our showroom has a great variety of new and vintage lamps, chandeliers, and decorative accessories for your home. Creativity and a dedication to quality and superior customer service have been the heart of our business for almost a century. Palette Studios began in the early 1900s when a tailor and his wife began making lampshades from their dining room table. Sometime in the 1930s they expanded to a small storefront in the chic Walnut Hills neighborhood and became a premier resource for interior design trade of Cincinnati. In 1975 Paul and Sharon Denight purchased the business from the original owners and began to grow and innovate with the times. They moved a few blocks East to our present location and expanded the showroom and the services and styles offered. Over the years fine porcelains, art objects, and hundreds of shapes and sizes of quality lamp shades have filled the store, each chosen with the vision of a unique lamp in mind. Today, Sharon Denight continues to lead Palette Studios with her team of dedicated employees who view this as a family not only a job. We continue to offer the same variety of unique vases and accessories chosen from sources cultivated over the years. We work with the finest lamp shade artisans in the country and strive to offer the highest quality in every product we offer. We are experts in repair and restoration of antique and vintage lamps and fixtures and do simple electrical repairs as well. We love to help customers find the perfect lamp to complement their décor or select and size a lamp shade to bring new life to an old favorite. Bring us your ideas and we will bring them to light! Our showroom is filled with the finest collection of traditional porcelains and decorative accessories. We offer a wide selection of floor lamps crafted from solid brass available in many finishes and styles. We have ready- made table lamps but we excel at making lamps to order from a piece chosen from our stock or supplied by the customer. We stock hundreds of high quality lamp shades in a variety of sizes, shapes, and neutral fabrics. We display a selection of vintage and custom chandeliers and can order from many of the popular lighting brands. We love to make lamps and chandeliers! Choose a vase or accessory piece from our collection or bring your own, we will work with you to create the lamp you envision. Have an idea for a fixture? Come in and see what we can do or just stop by and browse and see what we have created. We like to repurpose old and unusual objects and give them a new life. We offer custom lamp shades made in your own fabric or choose from the wide selection of available swatches. We have the ability to repair just about anything that has to do with lighting. In our fully equipped repair room, we can take care of everything from your simple repair needs to complex chandelier restorations. We do our best to give our clients all their options when it comes to repair. It might be as simple as replacing old parts that can no longer be repaired or completely remodeling a lamp so it can have a new life. Due to the fact that there are so many manufacturers, or the age of a piece, sometimes it can be a challenge. We will use all of our years of experience to give you the best possible solutions.